We’ve reported a lot on 3D printing in recent months, and it really is one of the more interesting and promising technologies out there right now. We’re seeing it used for everything from making toys to crafting artificial jaws, and those are some of the less insane ideas. Consider also such mind-boggling applications as “printing” up embryonic stem cells, or sending a set of 3D printers to build a custom moonbase. This story isn’t quite as out there as those, but it’s still pretty cool. Here’s Dita Von Teese modeling a 3D-printed dressed made specifically for her. The dress was created through the collaboration of 3D print specialists shapeways, designer Michael Schmidt, and architect Francis Bitonti. The dress is constructed of 17 different pieces, nearly 3,000 articulated joints, and thousands of crystals. The end result is a striking garment any interstellar alien queen would love to slip on. The one question I have is what the material feels like. It’s hard to tell from the images if the texture is soft, like most clothing, or if it’s more of a rubber/plastic/latex consistency. If the later, I’m thinking chafing could be a real and present danger. Did they have to 3D print some lube to get her into the damn thing? That’s not a dress. It has too many holes. 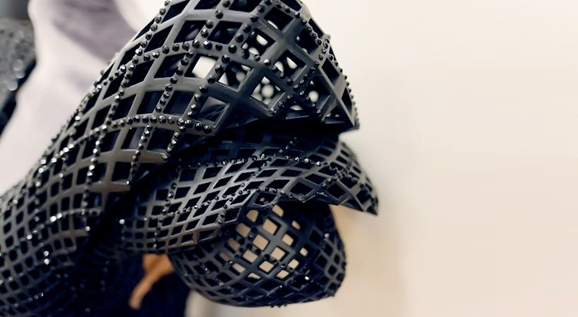 On second thought, I hope 3D printing is the future of the fashion industry.